As is so often the case, America’s prominent late-night comedians continue to turn leftist liars into heroes, giving them fawning forums to repeat their untruths while the comedians applaud them rather than challenge them. Witness Jimmy Fallon on Monday night, hosting Democratic U.S. Sen. Cory Booker of New Jersey. In less than ten minutes of air time, Booker uttered at least seven untruths or half truths – but Fallon applauded him as if he were a martyr for justice. Some of the fibs were relatively small, or at least typical liberal boilerplate. Booker claimed to live in a “low-income,” “inner-city community,” but his property there, in an attractive neighborhood, is valued by Zillow at $377,322. But the main part of Booker’s appearance, and obviously the reason he was invited, was for him to talk about the Senate Judiciary Committee hearings on Brett Kavanaugh’s nomination to the Supreme Court. 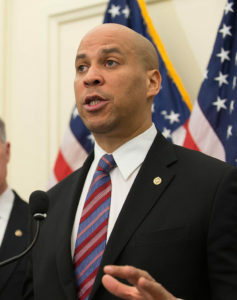 Booker made waves in that hearing by openly disparaging, and threatening to flout, committee rules on the confidentiality of certain documents. Booker claimed that “90 percent of [Kavanaugh’s] work product” has “not been released” to the public. This is laughable. The only way to make such a claim even within the outer realms of accuracy is to treat as Kavanaugh’s own work product the memos actually written by dozens of other people that merely crossed his desk while he was White House staff secretary….